How was the 2017 Audit Completed Without Completing the June 2017 General Ledger ? California Citizens have two big red flag to signal government corruption; the Brown Act and the Public Records Act. I started auditing the City of Beaumont in November, 2012 and have requested Payroll multiple times. The ‘Old Beaumont’ was corrupt, but they could release their Payroll. The ‘New Beaumont’ refuses to release their Payroll. Aside from violating the Public Records’ Act; the State of California requires government agencies to submit their Payroll to the State by March. The ‘New Beaumont’ also refuses to release their Payroll to the State. What/who is on the City of Beaumont’s Payroll that the City refuses to release it to anyone? Is Kapanicas still on the Payroll ? A Public Records’ Request was also submitted for the June 2017 General Ledger. A full year after the close of the June 2017 and after the release of the 2017 Audit the City claims that the June 2017 General Ledger is still in ‘Draft Form’. 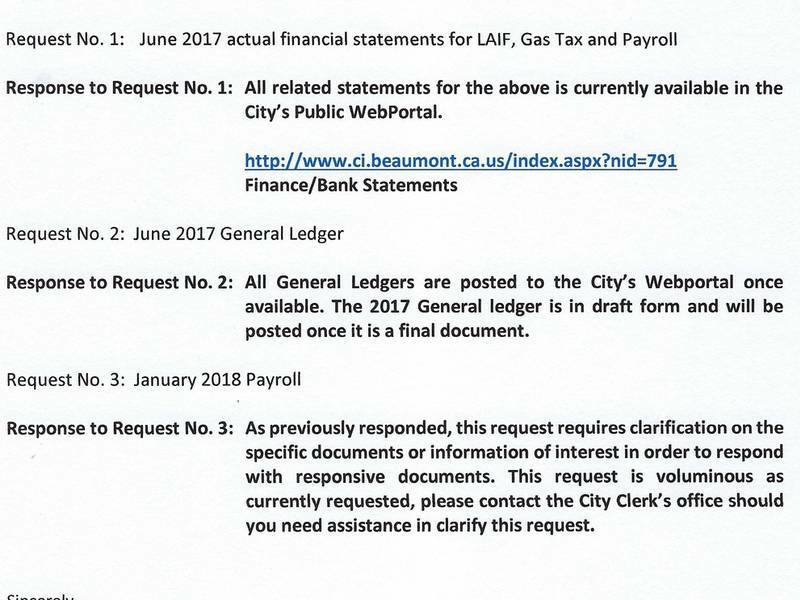 The best ‘truth’ that Beaumont’s corrupt government could come up with was that the City’s bookkeeping is over a year behind and the 2017 Audit was prepared without completing the General Ledger.